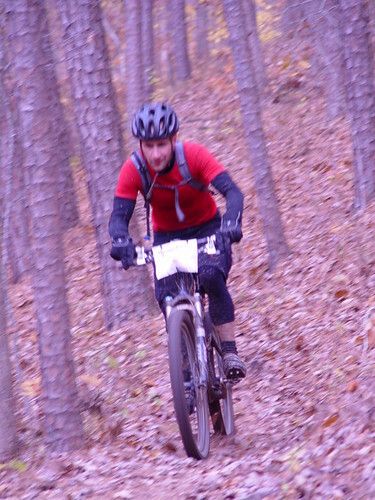 This weekend was the Berryman Epic mountain bike race utilizing the Berryman Trail near Steelville MO. It's a weekend long event with a tour Saturday and race Sunday. I arrived at Bass River Resort, the staging area for the race on Saturday afternoon as some of the first tour riders were returning from their 55 mile ride. They were a mess and all they could talk about was how tough and wet the course was. Luckily it was nice and warm with clear skies so everyone was optimistic that a lot of the water would drain away, the creeks would recede and the trails would be in better shape for the race. I wasn't so sure, but seeing how it was going to be my last race of the year I was up for anything. I slept well Saturday night in a campsite FAR away from everyone else and the pancake breakfast served at 6am had me ready to go for the 8:30am start time. We were able to load drop bags with supplies we'd be able to access at the 20 and 37 mile marks of the race. I loaded my bag with GU, dry socks and dry gloves. I hoped I'd only need the GU. I decided to ride with my camelbak for the race so I'd be able to carry more water. I've only got one bottle cage on my bike and didn't think it would get me through to the checkpoints. This is a very popular race and even with the less than stellar conditions there were LOTS of very good riders that turned out. My goal at the start was for a top 20 finish, but when I asked Stephan (my Teammate at Burnin) if I had a shot at it he said "No Way!". I think he comes from the Bobby Knight school of motivation. To be honest I had my doubts as well. Before the race I found out that Zdenek Palecek (my other Burnin teammate) had bought a 2010 Specialized Epic 29er and was riding it for the race. I myself am doing everything I can think of to acquire an S-Works Epic so I was more than a little jealous. But as they say “You gotta ride the horse that brung ya“ so me and my Stumpjumper FSR were ready to go. The race started with a short section of paved road, followed by a creek crossing where the organizers had set up a flatbed trailer to get the riders across. Since I wasn't at the front of the pack I had to wait about a minute at the bottleneck to get to the other side of the water, but at least my feet were still dry. That was followed by a mile or so of gravel road before turning onto the trail. There was a decent sized pack ahead of me and I was near the front of the second pack. When we turned into the woods I followed a couple other riders for a while until a hill climb where I was able to pass and move up. Before long I found the wheel of Rock Wamsley (also on a new 29er). He was riding a good pace so I figured we could work together and we passed a few people on our way to the first checkpoint; Brazil Creek campground about 10 miles into the race. The descent to the Brazil Creek crossing was a sloppy muddy mess but there was a temporary bridge built across the water which was nice. My legs were covered in mud by that point but anything that kept my toes from freezing water was appreciated. Right before the creek we passed Zdenek who was on the side of the trail fixing a flat. He said he didn't need any help so we kept going. Not long after the first checkpoint Rock got bogged down on a hill so I passed and decided to try to catch a few more riders. I rode behind a younger rider for a while until at the top of a pretty long climb he pulled to the side of the trail. I tried to encourage him to keep going but he said he'd follow. I didn't see him after that. None of the hills were all that steep but many of them were several minute climbs and when you combine that with the slick conditions it starts to wear on you. I was still feeling pretty good so I kept pushing myself on the flats and hills until I came across Bob Arnold of DRJ Racing on the side of the trail. He had just fixed a flat and was having problems with his CO2. I loaned him mine and then headed back down the trail. The second check point was at the 20 mile mark and was the first bag drop where we could get to our supplies. As I rode up I was told that only "about" 15 people had come through ahead of me. That picked my spirits up quite a bit and made me want to get back on the trail as fast as possible. Even though my feet were wet and cold I didn't want to take the time to change socks so I just filled my camelbak with gatorade, grabbed a few gu's and took off. I was passed by a couple people at the checkpoint (including Bob) but I caught up with them not long after. I rode behind Bob for awhile and was really liking his pace when I noticed my rear tire was loosing pressure. It was a slow leak so I rode it until the back tire was starting to move around on the turns. When I stopped to fill it Bob asked if I needed help before riding on. I couldn't find the source of the leak and didn't want to put in a tube so decided to just add air and hope the stans sealant inside the tire would seal it. I was passed by 2 riders as I filled the tire and they both asked if I needed anything. When I got going again I was able to catch back up to Bob again and I rode with him for awhile, then we were passed by Mike Barro of Momentum Cycles Racing on a single speed that I rode with until just after the 3rd checkpoint where we turned on a gravel road that lead back to the drop bag site. For some reason I struggled on that road; Mike left me and I was passed by Bob and another rider. My tire was still loosing air and getting low again but I figured if I could make it to the next checkpoint without stopping I'd be better off. I don't know why I thought that. Eventually the gravel road turned into a paved road that dead ended at a highway where there were signs to turn left. When I looked left I saw there were tracks in the ditch beside the highway so I turned into the ditch and kept going. That ditch was horrible. It had standing water and the weeds were so thick it felt like I had everything pushing against me as I rode. I stayed in the ditch for about a quarter mile before the signs said to take a right on a road leading to the berryman campground. When I looked at the highway that I'd just ridden beside I got really pissed off. I could have ridden on the shoulder of the road and avoided the hell of the ditch! The sign at the turn said the campground was 1 mile away, but it was pretty much 1 mile uphill. I was passed by 2 more riders on my way up that hill. My goal of a top 20 seemed to be slipping away. I was feeling pretty burnt and still had over 20 miles to go. As I pulled into the last checkpoint I was given the same "about 15 riders ahead" line which I was starting to believe they told everyone that pulled up. Then when I asked about a pump for my tire, Jim Davis from Team Seagal came over with a pump and helped me find the leak and we were able to get the stans to seal it. It was a small tear in the sidewall. We left the bike laying on it's side to help it seal while I went to get more GU and gatorade. My toes were numb from the cold but again I didn't want to spend the time changing socks. Not long after getting back on the bike I was able to catch up with Rock and we rode together for the next 12 miles or so. We were both tired and sore but at the same time were able to go faster as a team than we would have alone. I was working to keep up and Rock was working to stay ahead of me. We both complained on every hill along the way but I'm glad he was there to push me. On one of the flat muddy sections Zdenek passed us, and we didn't try to keep up with him. I don't remember what he said as he went by but I think it was something about mud. When we popped out onto a gravel road I wasn't expecting we lined up and rode hard to catch a couple riders in front of us. I asked one of them if he knew the course and he said the road lead all the way to the finish, but that it was still a long way. That's all I needed to hear and I took off. Rock wasn't feeling it and told me to go on. I spent a couple miles going back and forth with the top Women finisher, Catherine Walberg of Team Kenda Pro Cycling until I was able to pull away from her a little, then I caught up to Larry Koester of GORC on a singlespeed and we traded places a few times. I'd pass him going downhill (where I think he was drafting) and he'd pass me going up the next one. 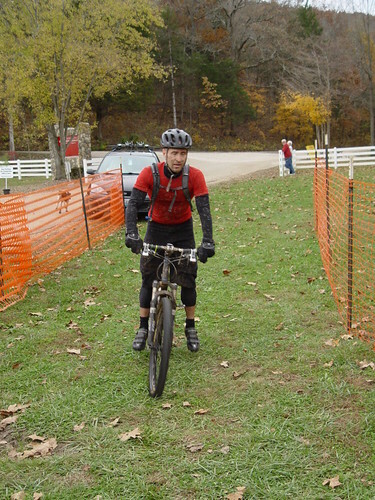 It turned out the final gravel road section was about 8 miles and was the same road we'd gone out on to start the race. Once we got to the place we'd turned to get to the trail at the start I knew how much riding was left and decided to make one last push to beat Larry. He was able to hold me off until we got to the river crossing about a quarter mile from the finish. Unfortunately the flatbed trailer was nowhere to be seen. Larry hit the water a few seconds before me, got off his bike and waded through the water. When I got off my bike and straightened my legs in the cold water they started cramping and I couldn't move for about 20 seconds. It was extremely painful and I forgot about Larry and started looking back for Catherine. Luckily the cramping stopped and I was able to cross the water and ride to the finish line, all the while looking over my shoulder. I crossed the finish line after 5 hours, 30 minutes and 51 seconds of racing; in 21st place. 16 seconds away from that top 20 I was after. Rock finished a few minutes back in 25th and Zdenek was in front of Larry in 19th. Stephen wound up finishing in 85th; riding the last 2 hours in the rain. Jon Schottler of CBC Race Team won with a time of 4.39.34. Amazingly, with the muddy trails, the top 4 finishers were able to break the course record with only 13 seconds between 1st and 2nd. There was a lot of talent on the trails that day. Here's a link to the results. Scott Davis and crew of Springfield Bicycle Company did an amazing job with this event. Considering everything that went on they pulled off a wonderful weekend. Not to mention the effort it took for them and their volunteers to prepare the course in the months leading up to the race. Hats off to them and I'll be back in 2010 (hopefully on an s-works epic! ).